Members of the public are invited to help bring out past to life by taking part in the UK’s largest archaeology festival and this year’s event promises to be bigger and better than before. The programme for this year’s Festival of Leicestershire and Rutland Archaeology has now been announced with over 70 events to be held across Leicestershire and Rutland between Saturday 16th and Sunday 31st July, celebrating the rich and fascinating archaeological heritage of the two counties. Members of the public excavating test-pits as part of the Charnwood Roots Project. The Festival in Leicestershire is supported by the University of Leicester who will be holding a number of events before and during the Festival. Members of the public are invited to attend the University excavations close to Bradgate House to see the results of the second year of a five year programme of investigation into the history of Bradgate Park. They can take a tour of Burrough Hill Iron Age Hillfort with University archaeologists who excavated the site, or take part and explore village history at Dig Rothley, a Charnwood Roots community excavation organised by the University. 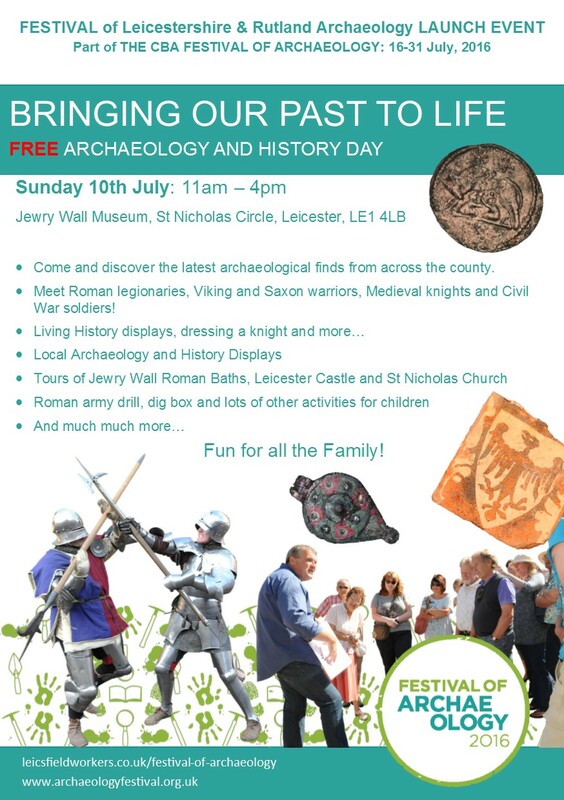 This year’s Festival kicks off with ‘Bringing Our Past To Life’ a free launch event at Jewry Wall Museum, Leicester, on Sunday July 10th (11am-4pm). This exciting family friendly day will preview the Festival, celebrating the county’s heritage with re-enactors and living-history, crafts and games, tours of Leicester City’s archaeology, and displays of recent discoveries from the City and County. Meet Roman legionaries, Viking and Saxon warriors, medieval knights, and Civil War soldiers; talk to local groups about their work (and join them perhaps! ); and discover what is going on during the Festival. The two-week long Festival, part of the Council of British Archaeology’s nationwide Festival of Archaeology 2016, once again proudly offers the biggest programme of events anywhere in the UK. The programme is packed with family friendly activities, guided walks, talks, displays and have-a-go events. Whether it’s a trip to the prehistoric hillforts at Breedon and Burrough Hill, a tour of one of the world’s first steam railway tunnels at Glenfield, or a hunt for medieval gargoyles at Church Langton, there really is something for everyone. The Festival brings together local archaeological organisations to showcase all that is great about our local archaeological heritage. Peter Liddle, Festival convenor, commented: “We are extremely pleased with this year’s programme. There is something for all the family, from children’s craft events at museums around the county to serious lectures. 3rd July Bradgate Park Excavation Open Day. 11am – 4pm. Bradgate Park, Newton Lindford, LE6 0HB. Visit the University excavations close to Bradgate House to see the results of the second year of a five year programme of investigation into the history of the Park. Guided tours of the excavations and Bradgate House will go on throughout the day along with many activities for all the family, including demonstrations, archaeological material to handle, re-enactors and exhibitors. FREE. 12th July Britain in the Roman Empire – what did the Romans do to us? 7pm – 9.30pm. The United Reformed Church, The Borough, Hinckley, LE10 1NL. A fascinating talk by Professor David Mattingly of the University of Leicester about the consequences of the Roman invasion and Britain in the Roman Empire. Did it improve our lives? Or not?!! Come and find out. £5 (including tea or coffee). Call Malcolm Lockett (01455 634765) for further information. Prior booking not essential. 16th July Guided walk of Bradgate Park Excavations. 2pm – 4pm. Meet at the Newtown Linford entrance to the Park, LE6 0HB. Visit the University of Leicester excavations in Bradgate Park for the end of season tour with archaeologists Dr Richard Thomas and Peter Liddle. This will be a chance to find out all that has been learned this year, the second season of a 5 year programme. Adults: £4, children FREE. No booking required. 23rd-24th July Dig Rothley. 9am – 5pm. Locations around Rothley. Come and join the Charnwood Roots Dig in Rothley or find out what has been discovered. Rothley residents will be digging test pits around the village centre with the help of volunteers and University of Leicester archaeologists to find out more about the village’s early history. The event is free and no previous experience is necessary but you must book a place in advance to take part. FREE. Details from Julie Attard. Email: jad17@leicester.ac.uk or visit www.charnwoodroots.org. 29th July Guided walk of Burrough Hill. 2pm – 4pm. Meet at the top of the track near Burrough Hill Country Park, Somerby Road, Burrough on the Hill, LE14 2QZ. Visit Leicestershire’s finest hill fort with University of Leicester Archaeological Service’s John Thomas and Andrew Hyam, who directed the 5 year programme of excavations on the site. They will take you round the site and describe the excavation findings. Adults: £3, children FREE. No booking required.